In conjunction with the Grab X Hello Kitty campaign, we have kept 10 sets of the Hitch Hello Kitty and Hitch Dear Daniel referrers! They come packaged in an exclusive box – made available only for you and you cannot get it anywhere else! Tell us in 50 words or less how you convinced your friends to drive with GrabHitch below. 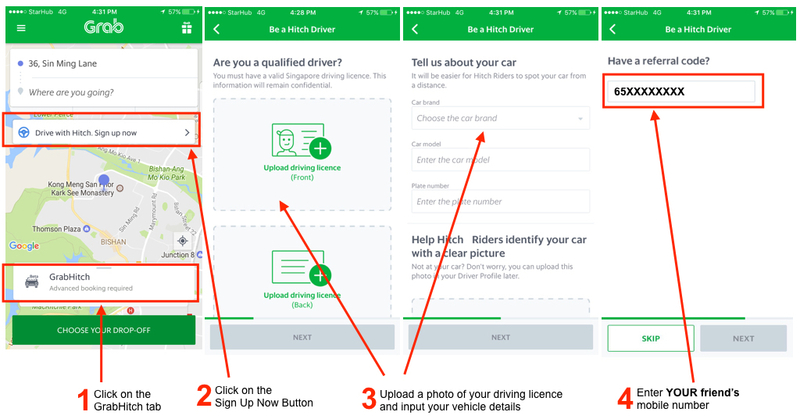 ^1 successful referral is defined as a driver who used your mobile number to apply as a GrabHitch driver, and completes at least 1 ride by 30th November. For each successful referral, you get $20 worth of promo codes, and your friend gets $20 credit in his / her driver wallet. When you refer 3 friends, you get $60 worth of promo codes and stand to win 1 of the Hitch-exclusive Hello kitty sets! After your friend completes ONE ride as a GrabHitch Driver, you get $20 worth of promo codes, and your friend gets $20 credit in his / her driver wallet. Remember to encourage your friend to do ONE ride by 30th November 2017 to qualify for the exclusive gift*! For enquiries on our DRD scheme, or if you have additional feedback on GrabHitch, please email us at : support.sg@grab.com with the Subject: GrabHitch PRD and we will get back to you in 1-3 working days. Alternatively, do text us at 8429 9032 (Monday – Friday, 10am – 6pm) for assistance. The $20 promo code for referrer / $20 credit for referred scheme runs from 1st November 2017 @ 00:00 hours – 30th November 2017 @ 12:00 hours. Passengers will only receive their $20 worth or more of Grab Promo Codes if each referred friend successfully completes ONE GrabHitch rides as a driver by 12:00hrs on 30th November. After the referred driver has completed his/her ride as a driver, please allow up to 10 working days after the incentive period has ended (ie. post-30th November) for the $20 worth or more of Grab Promo Codes to be processed. For both our driver and passenger referrers, 10 sets of the exclusive Hitch Hello Kitty sets have been set aside in total. You will only be eligible to win the Hitch-exclusive Hello Kitty set if you have referred at least 3 friends to drive with GrabHitch who went on to complete at least 1 ride by 12:00hrs on 30th November, and completed the form above. Winners will be contacted by 15th December via email and mobile, and you will need to personally collect the plushies at Grab Office – 18 Sin Ming Lane, Midview City, #01-11. No returns or exchanges will be accepted, and you agree to accept the plushies in its current condition at time of collection. Drivers have to sign up with the Passenger’s mobile number (include 65 in front e.g. 6512345678) and do ONE successful GrabHitch ride as a driver by 12:00hrs on 30th November to count as a successful referral. After completing your 1 GrabHitch ride, please allow up to 10 working days after the incentive period has ended (ie. post-30th November) for the $20 credit to be transferred into your GrabHitch driver wallet.